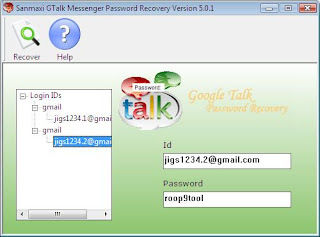 Sanmaxi Gtalk Messenger Password Recovery allows you to recovers all the Google Talk accounts stored on your local computer. This tool find and decrypt Google Talk passwords when "Remember Password" checkbox is ticked in GTalk. It supports all versions of Google Talk. * Users does not require any extra technical skill to operate the software and retrieves lost forgotten passwords. * It works when the "Remember my passwords" or "Sign me in automatically" tickbox is checked in the messenger. * All passwords are recovered instantly regardless of the length of passwords. * It has very powerful software and easy to use Graphical User Interface (GUI). * It is compatible with Windows Vista/XP/2000/2003 and support multiple profile password recovery.